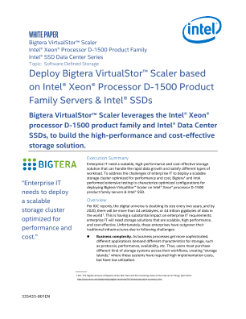 Bigtera VirtualStor* Scaler leverages the Intel® Xeon® processor D-1500 product family and Intel® SSD Data Center Family, to build the high-performance and cost-effective storage solution. Enterprise IT need a scalable, high-performance and cost-effective storage solution that can handle the rapid data growth and satisfy different types of workload. To address the ...challenges of enterprise IT to deploy a scalable storage cluster optimized for performance and cost, Bigtera and Intel performed extensive testing to characterize optimized configurations for deploying Bigtera VirtualStor* Scaler on Intel® Xeon® processor D-1500 product family servers with the Intel® SSD Data Center Family.